NES is your local Electric Vehicle (EV) Charger installer for residential homes and commercial businesses. NES added EV Charger installations to their services because their customer base showed a legitimate need for this service. Many of our customers own an EV, or they plan to buy one soon. We are able to install the EV Charger alongside your solar installation. When we install solar panels and an EV Charger for a property owner, we know our hard work results in a positive impact on the environment. Driving your EV off of solar electricity is the cheapest fuel you will find! Contact us today and let us know your current EV model or, which EV you plan to purchase in the future. Q: Which EV Charger is best? A: Finding the best EV Charger for you depends on a few factors. The make and model of your vehicle is a great place to start. We can recommend different EV Chargers based on your needs. In the past, we have installed Chargepoint EV Chargers and the SolarEdge all-in-one EV Charger Inverter. Q: I have an EV, but not an EV Charger at my house. Why should I install solar panels at my property? A: Solar installations and EV Chargers really are a perfect match! When you purchase an EV, you make a positive choice in reducing your emissions and leaving your combustion engine in the dust! Although, you are now transfering your need for fuel to your Utility Bill. The electricity you purchase from the Utility is a mix of many different forms of energy production — some renewable and some not. When you add solar to your property, you are ensuring that your EV’s fuel comes from the sun! On top of that, the financial benefits are significant. Installing solar panels results in the lowest possible cost per kilowatt-hour (kWh). The Utility charges you per kWh, so lowering that cost is equivalent to lowering your cost per gallon for a fossil fuel vehicle. Q: What are the benefits of an EV Charger in my house instead of just using the existing garage outlet? A: The main benefit of the EV Charger is a much lower charge time. The EV Charger allows for the EV to fill it’s battery more quickly. Who wants to delay their departure time because their EV takes 6+ hours to charge?! 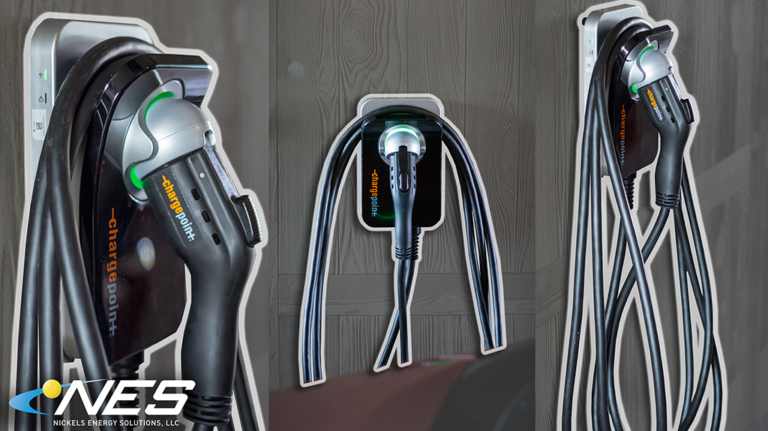 Get a full charge in a fraction of the time with an EV Charger installed by NES.